Hutterites (German: Hutterer), also called Hutterian Brethren (German: Hutterische Brüder), are an ethnoreligious group that is a communal branch of Anabaptists who, like the Amish and Mennonites, trace their roots to the Radical Reformation of the early 16th century. The founder of the Hutterites, Jacob Hutter, "established the Hutterite colonies on the basis of the Schleitheim Confession, a classic Anabaptist statement of faith" of 1527, with the first communes being formed in 1528. Since the death of their eponym Jacob Hutter in 1536, the beliefs of the Hutterites, especially living in a community of goods and nonresistance, have resulted in hundreds of years of diaspora in many countries. They embarked on a series of migrations through central and eastern Europe. Nearly extinct by the 18th century, the Hutterites migrated to Russia in 1770 and about a hundred years later to North America. Over the course of 140 years, their population living in community of goods recovered from about 400 to around 45,000. Today, almost all Hutterites live in Western Canada and the upper Great Plains of the United States. The Anabaptist movement, from which the Hutterites emerged, started in circles around Huldrych Zwingli (1484 – 1531) who led the early Reformation in Switzerland. In Zurich on January 21, 1525, Conrad Grebel (c. 1498–1526) and Jörg Blarock (c. 1491–1529) practiced adult baptism to each other and then to others. 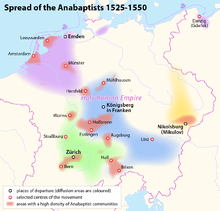 From Switzerland Anabaptism quickly spread to the North and the East, in the timespan of only one year. Balthasar Hubmaier (c. 1480–1528), a Bavarian from Friedberg, became an Anabaptist in Zurich in 1525 but fled to Nikolsburg in Moravia in May 1526. Other early Anabaptists who became important for the emerging Hutterites were Hans Denck (c. 1500–1527), Hans Hut (1490–1527), Hans Schlaffer († 1528), Leonhard Schiemer (c. 1500–1528), Ambrosius Spittelmayr (1497–1528) and Jakob Widemann († 1536). Most of these early Anabapitists soon became martyrs of their faith. Anabaptism appears to have come to Tyrol through the labors of Jörg Blaurock. Similar to the German Peasants' War, the Gasmair uprising set the stage by producing a hope for social justice. Michael Gasmair had tried to bring religious, political, and economical reform through a violent peasant uprising, but the movement was squashed. Although little hard evidence exists of a direct connection between Gasmair's uprising and Tyrolian Anabaptism, at least a few of the peasants involved in the uprising later became Anabaptists. While a connection between a violent social revolution and non-resistant Anabaptism may be hard to imagine, the common link was the desire for a radical change in the prevailing social injustices. Disappointed with the failure of armed revolt, Anabaptist ideals of an alternative peaceful, just society probably resonated on the ears of the disappointed peasants. In the 16th century, there was a considerable degree of religious tolerance in Moravia because in the 15th century there had been several proto-Protestant movements and upheavals (Czech Brethren, Utraquists, Picards, Minor Unity) in Bohemia and Moravia due to the teachings of Jan Hus (c. 1369–1415). Therefore, Moravia, where Hubmaier had also found refuge, was the land where the persecuted Anabaptist forerunners of the Hutterites fled to, originating mostly from different locations in what is today Southern Germany, Austria and South Tyrol. Under the leadership of Jacob Hutter in the years 1530 to 1535, they developed the communal form of living which distinguishes them from other Anabaptists such as the Mennonites and the Amish. Hutterite communal living is based on the New Testament books of the Acts of the Apostles (chapters 2 (especially verse 44), 4, and 5) and 2 Corinthians. A basic tenet of Hutterite groups has always been nonresistance, forbidding its members from taking part in military activities, taking orders from military persons, wearing a formal uniform (such as a soldier's or a police officer's) or paying taxes to be spent on war. This has led to expulsion or persecution in the several lands in which they have lived. In Moravia, the Hutterites flourished for several decades; the period between 1554 and 1565 was called "good" and the period between 1565 and 1592 was called "golden". During that time the Hutterites expanded to Slovakia, then part of the Kingdom of Hungary and called "Upper Hungary". In the time until 1622 some 100 settlements, called Bruderhof, developed in Moravia and Slovakia and the number of Hutterites reached twenty to thirty thousand. In 1593 the Long Turkish War, that affected the Hutterites severely, broke out and lasted until 1606. During this war, in 1605, some 240 Hutterites were abducted by the Ottoman Turkish army and their Tatar allies and sold into Ottoman slavery. Before the Hutterites could rebuild their resources the Thirty Years' War (1618–1648) broke out and soon developed into a war about religion, when in 1620 the mostly Protestant Bohemia and Moravia were invaded by the Habsburg Emperor Ferdinand II, a Catholic, who annihilated and plundered several Hutterite settlements. In 1621 the Bubonic plague followed the war and killed one third of the remaining Hutterites. Renewed persecution followed the Habsburg takeover of the Czech lands in 1620 and in the end annihilated them there as an Anabapist group. In 1622 the Hutterites were expelled from Moravia and fled to the Hutterite settlements in Slovakia, which became totally overcrowded, causing severe hardship. Some Moravian Hutterites converted to Catholicism and retained a separate ethnic identity as the Habans (German: Habaner) until the 19th century (by the end of World War II, the Haban group had become essentially extinct). In 1621 Gabriel Bethlen, prince of Transylvania and a Calvinist, 'invited' Hutterites to come to his country. In fact he forced a group of 186 Hutterites to come to Alwinz in 1622, because he needed craftsmen and agricultural workers to develop his land. In the next two years more Hutterites migrated to Transylvania, in total 690 or 1,089 persons, depending on the sources. In the second half of the 17th century the Hutterite community was in decline. It had suffered from Ottoman incursions during which the Bruderhof at Alvinz was burnt down in 1661. Towards the end of the century, community of goods was abandoned, when exactly is not known. Johannes Waldner assumes in Das Klein-Geschichtsbuch der Hutterischen Brüder that this happened in 1693 or 1694. In 1756, a group of Crypto-Protestants from Carinthia who in 1755 were deported to Transylvania by the Habsburg Monarchy, met the Hutterian Brethren at Alvinz. These Carinthian Protestants read the "account of the belief of the Hutterian Brethren" written by Peter Riedemann, which was given to them by the Brothers and then decided to join the Hutterites. This latter group revived the Hutterite religion, became dominant among the Hutterites and replaced the Tyrolean dialect of the old Hutterites by their Carinthian one, both being Southern Bavarian dialects. In 1762 community of goods was reestablished in Alvinz. In 1767 the Hutterites fled from Transylvania first to Kräbach, that is Ciorogârla in Wallachia, which was at that time some 7 km from Bucharest. When the Hutterites left Transylvania, their number was down to 67 people. In Wallachia they encountered much hardship because of lawlessness and the war between Russia and Turkey (1768–1774). The Russians took Bucharest on 17 November 1769. The Hutterites then sought the advice of Russian army commander "Sämetin" (Генерал-майор Александр Гаврилович Замятин) in Bucharest who proposed that they emigrate to Russia where Count Pyotr Rumyantsev would provide them with land all they need for a new beginning. On 1 August 1770, after more than three month of traveling, the group of about 60 persons reached their new home, the lands of Count Rumyantsev at Vishenka in Ukraine, which at this time was part of the Russian Empire. In their new home the Hutterites where joined by a few more Hutterites who could flee from Habsburg lands and a few Mennonites, altogether 55 persons. When Count Pyotr Rumyantsev died in 1796 his two sons tried to reduce the status of the Hutterites from free peasants (Freibauern) to that of serfs (Leibeigene). The Hutterites appealed to Tsar Paul I and were allowed to settle on crown land in Radichev, some 12 km far from Vishenka, where they would have the same privileged status as the German Mennonite colonists from Prussia. Around the year 1820 there was significant inner tension and a large faction of the brothers wanted to end the community of goods. The community then divided into two groups and lived in separate communities. The faction with individual ownership moved to the Mennonite colony Chortitza for some time, but soon returned. After a fire destroyed most of the buildings at Radichev, the Hutterites gave up their community of goods. Because the lands of the Hutterites at Radichev were not very productive, they petitioned to move to better lands and in 1842 they were allowed to relocate to Molotschna, a Mennonite colony, where they founded the village Hutterthal. When they moved, the total Hutterite population was 384 with 185 males and 199 females. In 1852 a second village was founded, called Johannesruh, and by 1868, three more villages were founded; Hutterdorf (1856), Neu-Huttertal (1856), and Scheromet (1868). In Ukraine, the Hutterites enjoyed relative prosperity. When they lived among German-speaking Mennonites in Molotschna, they adopted the very efficient form of Mennonite agriculture which Johann Cornies had introduced. In 1845, a small group of Hutterites made plans to renew the community of goods, but was told to wait until the government approved their plans to buy separate land. A group led by the preacher George Waldner made another attempt but this attempt soon failed. In 1859 Michael Waldner was able to reinstate community of goods at one end of Hutterdorf, thus becoming the founder of the Schmiedeleut. In 1860, Darius Walter founded another group with community of goods at the other end of Hutterdorf, thus creating the Dariusleut. Trials to establish a communal living in Johannisruh after 1864 did not succeed. It took until in 1877, when the Hutterites had already relocated to South Dakota, that a few families from Johannisruh, led by preacher Jacob Wipf, established a third group with communal living, the Lehrerleut. In 1864, the Primary Schools Bill made Russian the language of instruction in schools and in 1871 a law introduced compulsory military service which led the Mennonites and Hutterites to make plans for emigration. After sending scouts to North America in 1873 along with a Mennonite delegation, almost all Hutterites, totaling 1,265 individuals, migrated to the United States between 1874 and 1879 in response to the new Russian military service law. Of these, some 800 identified as Eigentümler (literally, 'owners') and acquired individual farms according to the Homestead Act of 1862, whereas some 400 identified as Gemeinschaftler (literally, 'community people') and started three communities with community of goods. Most Hutterites are descended from these latter 400. Named for the leader of each group (the Schmiedeleut, Dariusleut and Lehrerleut, leut being based on the German word for people), they settled initially in the Dakota Territory. Here, each group reestablished the traditional Hutterite communal lifestyle. Over the next decades, the Hutterites who settled on individual farms, called Prärieleut, slowly assimilated first into Mennonite groups and later into the general American population. Until about 1910 there was intermarriage between the Prärieleut and the communal living Hutterites. Several state laws were enacted seeking to deny Hutterites religious legal status to their communal farms (colonies). Some colonies were disbanded before these decisions were overturned in the Supreme Court. By this time, many Hutterites had already established new colonies in Alberta and Saskatchewan. During World War I, the pacifist Hutterites suffered persecution in the United States. In the most severe case, four Hutterite men subjected to military draft who refused to comply were imprisoned and physically abused. Ultimately, two of the four men, the brothers Joseph and Michael Hofer, died at Leavenworth Military Prison from mistreatment, after the Armistice had been signed ending the war. The Hutterites responded to this mistreatment of their conscientious objectors by leaving the United States and moving to the Canadian provinces of Alberta, Manitoba and Saskatchewan. All 18 existing American colonies were abandoned, except the oldest one, Bon Homme, where Hutterites continued to live. Other colonies moved to Canada but did not sell their vacant colonies. In 1942, alarmed at the influx of Dakota Hutterites buying copious tracts of land, the province of Alberta passed the Communal Properties Act, severely restricting the expansion of the Dariusleut and Lehrerleut colonies. The act was repealed in 1973, allowing Hutterites to purchase land. This act resulted in the establishment of a number of new colonies in British Columbia and Saskatchewan. Section 143 of the Income Tax Act of Canada now contains special rules to accommodate Hutterite colonies. During the Great Depression when there was a lot of economic pressure on farming populations, some Schmiedeleut moved back to South Dakota, resettling abandoned property and buying abandoned colonies from the Darius- and the Lehrerleut. After World War II also the Darius- and the Lehrerleut went back to the US, mainly to Montana. Contrary to other traditional Anabaptist groups like the Amish, the Old Order Mennonites and the Old Colony Mennonites, who have almost no written books about Anabaptist theology, the Hutterites possess an account of their belief by Peter Riedemann (Rechenschafft unserer Religion, Leer und Glaubens) and theological tracts and letters by Hans Schlaffer, Leonhard Schiemer and Ambrosius Spittelmaier are extant. The founder of the Hutterite tradition, Jacob Hutter, "established the Hutterite colonies on the basis of the Schleitheim Confession, a classic Anabaptist statement of faith". In accordance with this confession of faith, Hutterite theology emphasizes credobaptism, a belief in the Church invisible, Christian pacifism, and the rejection of oaths. The Hutterite Churches also believe in "a set of community rules for Christian living and the principle of worldly separation". Hutterite communes, called "colonies", are all rural; many depend largely on farming or ranching, depending on their locale for their income. Colonies in the modern era have been shifting to manufacturing as it gets more difficult to make a living on farming alone. The colony is virtually self-sufficient as far as labor, constructing its own buildings, doing its own maintenance and repair on equipment, making its own clothes, etc. This has changed in recent years and colonies have started to depend a little more on outside sources for food, clothing, and other goods. Hutterite agriculture today is specialized and more or less industrialized. Hutterite children therefore have no close contact with farm animals anymore and are not protected from asthma through close contact with farm animals, like Amish children are, but are now similar to the general North American population. 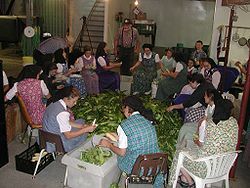 Hutterite colonies are mostly male-managed with women participating in roles such as cooking, medical decisions, and selection and purchase of fabric for clothing. Each colony has three high-level leaders. The two top-level leaders are the Minister and the Secretary. A third leader is the Assistant Minister. The Minister also holds the position as President in matters related to the incorporation of the legal business entity associated with each colony. The Secretary is widely referred to as the colony "Manager", "Boss" or "Business Boss" and is responsible for the business operations of the colony, such as bookkeeping, cheque-writing and budget organization. The Assistant Minister helps in church leadership (preaching) responsibilities, but will often also be the "German Teacher" for the school-aged children. The Secretary's wife sometimes holds the title of Schneider (from German "tailor") and thus she is in charge of clothes making and purchasing the colony's fabric requirements for making of all clothing. The term "boss" is used widely in colony language. Aside from the Secretary who functions as the business boss, there are a number of other significant "boss" positions in most colonies. The most significant in the average colony is the "Farm Boss." This person is responsible for all aspects of overseeing grain farming operations. This includes crop management, agronomy, crop insurance planning and assigning staff to various farming operations. Beyond these top-level leadership positions there will also be the "Hog Boss","Dairy Boss", and so on, depending on what agricultural operations exist at the specific colony. In each case, these individuals are fully responsible for their area of responsibility and will have other colony residents working in their area. The Minister, Secretary, and all "boss" positions are elected positions and many decisions are taken to a vote before they are implemented. The voting and decision-making process at most colonies is based upon a two-tiered structure including a council—usually seven senior males—and the voting membership which includes all the married men of the colony. For "significant" decisions the council will first vote and, if passed, the decision will be carried to the voting membership. This structure has resulted in a democratic culture in most colonies. Officials not following the democratically selected decisions can be removed by a similar vote of a colony. There is a wide range of leadership cultures and styles between the three main colony varieties. In some cases very dominant ministers or secretaries may hold greater sway over some colonies than others. However, the general prevailing culture in most colonies is strongly democratic. Women and children hold no formal vote in decision-making power in a colony. They often hold influence on decision-making through the informal processes of a colony's social framework. Overarching all internal governance processes within a single colony is the broader "Bishop" structure of leaders from across a "branch" (Lehrer-, Darius- or Schmiedeleut) such that all colonies within each branch are subject to the broader decision-making of that branch's "Bishop" council. A minister of a colony who does not ensure his colony follows broader "Bishop" council decisions can be removed from his position. Hutterites practice a near-total community of goods: all property is owned by the colony, and provisions for individual members and their families come from the common resources. This practice is based largely on Hutterite interpretation of passages in chapters 2, 4, and 5 of Acts, which speak of the believers "having all things in common". Thus the colony owns and operates its buildings and equipment like a corporation. Housing units are built and assigned to individual families but belong to the colony and there is very little personal property. Lunch and dinner meals are taken by the entire colony in a dining or fellowship room. Men and women sit in a segregated fashion. Special occasions sometimes allow entire families to enjoy meals together. Individual housing units do have kitchens which are used for breakfast meals. Each colony may consist of about 10 to 20 families (may not always apply), with a population of around 60 to 250. When the colony's population grows near the upper limit and its leadership determines that branching off is economically and spiritually necessary, they locate, purchase land for, and build a "daughter" colony. The process by which a colony splits to create a new daughter colony varies across the branches of colonies. In Lehrerleut, this process is quite structured, while in Darius and Schmiedeleut the process can be somewhat less structured. In a Lehrerleut colony, the land will be purchased and buildings actually constructed before anyone in the colony knows who will be relocating to the daughter colony location. The final decision as to who leaves and who stays will not be made until everything is ready at the new location. During the construction process, the colony leadership splits the colony up as evenly as possible, creating two separate groups of families. The two groups are made as close as possible to equal in size, taking into account the practical limits of family unit sizes in each group. Additionally, the leadership must split the business operations as evenly as possible. This means deciding which colony might take on, for example, either hog farming or dairy. Colony members are given a chance to voice concerns about which group a family is assigned to, but at some point, a final decision is made. This process can be very difficult and stressful for a colony, as many political and family dynamics become topics of discussion, and not everyone will be happy about the process or its results. Once all decisions have been made, the two groups might be identified as "Group A" and "Group B". The last evening before a new group of people is to leave the "mother" colony for the "daughter" colony, two pieces of paper, labeled "Group A" and "Group B", are placed into a hat. The minister will pray, asking for God's choice of the paper drawn from the hat, and will draw one piece of paper. The name drawn will indicate which group is leaving for the daughter colony. Within hours, the daughter colony begins the process of settling a brand new site. This very structured procedure differs dramatically from the one that might be used at some Darius and Schmiedeleut colonies, where the split can sometimes be staggered over time, with only small groups of people moving to the new location at a time. Hutterite colonies often own large tracts of land and, since they function as a collective unit, can make or afford higher quality equipment than if they were working alone. Some also run industrial hog, dairy, turkey, chicken, and egg production operations. An increasing number of Hutterite colonies are again venturing into the manufacturing sector, a change that is reminiscent of an early period of Hutterite life in Europe. Before the Hutterites emigrated to North America, they relied on manufacturing to sustain their communities. It was only in Russia that the Hutterites learned to farm from the Mennonites. Because of the increasing automation of farming (large equipment, GPS-controlled seeding, spraying, etc. ), farming operations have become much more efficient. Many colonies that have gone into manufacturing believe they need to provide their members with a higher level of education. A major driving force for Hutterite leadership today is the recognition that land prices have risen dramatically in Alberta and Saskatchewan because of the oil and gas industry, thus creating the need for a greater amount of cash to buy land when it comes time for a colony to split. The splitting process requires the purchase of land and the construction of buildings. This can require funds in the range of $20 million CDN in 2008 terms, upwards of $10M for land and another $10M for buildings and construction. This massive cash requirement has forced leadership to re-evaluate how a colony can produce the necessary funds. New projects have included plastics manufacturing, metal fabrication, cabinetry, and stone or granite forming, to name a few. One unique project came together in South Dakota. A group of 44 colonies joined to create a turkey processing center where their poultry can be processed. The plant hired non-Hutterite staff to process the poultry for market. This plant helped to secure demand for the colonies' poultry. Hutterites do not shun modern technology, but may limit some uses of it. They attempt to remove themselves from the outside world (televisions – and in some cases the internet – are banned), and up until recently, many of the Lehrerleut and Dariusleut (Alberta) colonies still only had one central phone. The Schmiedeleut had made this transition earlier, where each household had a telephone along with a central phone for the colony business operation. Phones are used for both business and social purposes. Cell phones are also very common among all three groups today. Text messaging has made cell phones particularly useful for Hutterian young people wishing to keep in touch with their peers. Most Hutterite homes have computers and radios; a minority of communities (mostly, liberal Schmiedeleut colonies) have Internet access. Farming equipment technology generally matches or exceeds that of non-Hutterite farmers. Lehrerleut colonies have recently struggled with the proliferation of computers and have clamped down so that computers are no longer allowed in households and their use is limited to only business and farming operations including animal, feed and crop management. But as the world evolves more and technology is used more and more for work and communication, many Hutterite young people use computers, photos, and the internet for keeping in contact with their friends, relatives and meeting new people outside the colony. Rather than send their children to an outside school, Hutterites build a schoolhouse at the colony to fulfill the educational agreement with the province or state. The school is typically run by a hired "outside" teacher who teaches the basics including English. In some Schmiedeleut schools, teachers are chosen from the colony. The "German" education of colony children is the responsibility of the "Assistant Minister" at some colonies, but most colonies elect a "German Teacher", who in most cases also takes care of the colony garden. His job entails training in German language studies, Bible teaching, and scripture memorization. The German Teacher will cooperate with the outside teacher with regard to scheduling and planning. Some Hutterite colonies are allowed to send their children to public school as the parents see fit, but in some cases it is customary to remove them from school entirely in 8th grade or at the age of 15; however, many colonies offer them a full grade 12 diploma and in some cases a university degree. Public school in these instances is seen as a luxury and children are sometimes made to miss days of school in favor of duties at the colony. In a few rare cases, allowing a child to continue attending school past this limit can result in punishment of the parents, including shunning and removal from the church. Three different branches of Hutterites live in the prairies of North America: the Schmiedeleut, the Dariusleut and the Lehrerleut. Though all three "leut" are Hutterites, there are some distinctive differences, including style of dress and organizational structure. [clarification needed] However, the original doctrine of all three groups is identical. The differences are mostly traditional and geographic. There are two other related groups. The Arnoldleut—also referred to as the Bruderhof Communities or currently, Church Communities International—is a group of more recent origin which, prior to 1990, were accepted by the Dariusleut and Lehrerleut groups as a part of the Hutterite community. The Schmiedeleut were divided over the issue. One group is called the 'oilers', because of an issue over an oil well. The other is the Prairieleut – Hutterites that lived in separate households rather than in colonies after settling on the American prairies. At the time of immigration the Prairieleut amounted to around 2/3 of the Hutterite immigrants. Most of the Prairieleut eventually united with the Mennonites. Since 1992, the Schmiedeleut, until that point the largest of the three "leut," have been divided into "Group One" and "Group Two" factions over controversies including the Arnoldleut/Bruderhof issue and the leadership of the Schmiedeleut elder. This highly acrimonious division has cut across family lines and remains a serious matter almost two decades later. Group One colonies generally have relatively more liberal positions on issues including higher education, ecumenical and missions work, musical instruments, media, and technology. Alberta Hutterites initially won the right not to have their photographs taken for their drivers' licenses. In May 2007, the Alberta Court of Appeal ruled that the photograph requirement violates their religious rights and that driving was essential to their way of life. The Wilson Colony based its position on the belief that images are prohibited by the Second Commandment. About eighty of the photo-less licenses were in use at the time of the decision. Besides the Alberta Hutterite groups (Darius and Lehrerleut), a handful of colonies in Manitoba (Schmiedeleut) do not wish their members to be photographed for licenses or other identity documents. However, in July 2009, the Supreme Court of Canada ruled 4–3 (in Alberta v. Hutterian Brethren of Wilson Colony) that a Hutterite community must abide by provincial rules that make a digital photo mandatory for all new driver's licenses as a way to prevent identity theft. Despite this animosity towards photography, there are photographs of Hutterites which were evidently done with their consent and co-operation. In particular, from 1972–1980, Chicago photographer Mary Koga went to rural Alberta to work on her series The Hutterites. Her images show the members of the community with great openness, sympathy and a touch of humor. 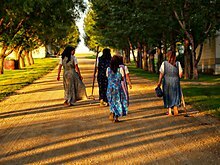 Hutterite women return from working in the fields at sunset. In contrast to the uniformly plain look of the Amish and Old Order Mennonites, Hutterite clothing can be vividly colored, especially on children, although many Hutterites do wear plain dress. Most of the clothing is homemade within the colony. Shoes were homemade in the past but are now mostly store-bought. Men's jackets and pants are usually black. Generally the men's shirts are button-up shirts with long sleeves and collars, and they may wear undershirts. Men's pants are not held in place by belts, but rather by black suspenders. These pants are also distinctive by their lack of back pockets. Women and girls wear a dress with a blouse underneath. Most Lehrerleut and Dariusleut also wear a kerchief-style Christian headcovering which is usually black with white polka dots. The Schmiedleut also wear a kerchief-style head cover, but without the dots. The polka dots tells which branch the women belong to. Young girls wear a bright, colorful cap that fastens under the chin. Church garb is generally dark for both men and women. The clothing worn for church consists of a plain jacket for both genders and a black apron for women. Men's church hats are always dark and usually black. 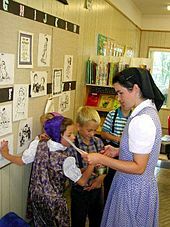 Just as the Amish and Old Order Mennonites often use Pennsylvania German, the Hutterites have preserved and use among themselves a distinct dialect of German known as Hutterite German, or Hutterisch. Originally mainly based on a Tyrolean dialect from the south-central German-speaking Europe from which many of them sprang in the 16th century, Hutterisch has taken on a Carinthian base because of their history: In the years 1760–1763, a small group of surviving Hutterites in Transylvania were joined by a larger group of Lutheran forced migrants from Carinthia, the so-called Transylvanian Landler. Eventually, this led to the replacement of the Hutterites' Tyrolean dialect with the Carinthian dialect. The Amish and Hutterite German dialects are not generally mutually intelligible because the dialects originate from regions that are several hundred kilometers apart. In their religious exercises, Hutterites use a classic Lutheran German. The very high birth rate among the Hutterites has decreased dramatically since 1950, as they have dropped from around ten children per family in 1954 to under five in 2010 and even lower in the years since then. Hutterite fertility rates remain relatively high compared to the general North American population, but relatively low compared to other traditional Anapatist groups like the Amish or the Old Order Mennonites. While Hutterite women traditionally married around the ages of 20 or 21, marriage in the 21st century very often is delayed until the late 20s. Whereas Hutterite women traditionally had children until their mid 40s, today most Hutterite woman have their last child around the age of 35. As part of their Anabaptist teachings of nonresistance, Hutterites have historically avoided getting involved in litigation within the secular justice system. One of the early founders of the Hutterites, Peter Riedemann, wrote about the Hutterite's stand on going to court in Peter Riedemann's Hutterite Confession of Faith: "Christ shows that Christians may not go to court when he says, 'If anyone will sue you and take away your coat, let him have your cloak also.' In effect Jesus is saying, 'It is better to let people take everything than to quarrel with them and find yourself in a strange court.' Christ wants us to show that we seek what is heavenly and belongs to us, and not what is temporal or alien to us. Thus, it is evident that a Christian can neither go to court nor be a judge." Consistent with their beliefs, records do not indicate any litigation initiated by the Hutterites up to the twentieth century. However, in their more recent history in North America some Hutterite conflicts have emerged in court litigations. Several cases involved the Hutterite Colony defending their religious lifestyle against the government. This includes the recent conflict over photographs on driver's licenses in Alberta v Hutterian Brethren of Wilson Colony. Another recent case in the United States, Big Sky Colony Inc. v. Montana Department of Labor and Industry, forced the Hutterites to participate in the state's workers compensation system despite the Hutterites religious objections. The willingness of the colonies to take matters to secular courts has also resulted in internal religious disputes being brought before the court. Two of these cases have come by appeal before the Supreme Court of Canada: Hofer v. Hofer (1970) and Lakeside Colony of Hutterian Brethren v. Hofer (1992). Hofer v. Hofer involved several expelled members of the Interlake Colony in Manitoba who sought a share of the communal property. The Supreme Court of Canada ruled that according to the religious tenets of the Hutterites the Hutterites have no individual property and therefore the former members cannot be entitled to a share of the Hutterite colony goods. In the case of Lakeside Colony of Hutterian Brethren v. Hofer, Daniel Hofer Sr. of Lakeside Colony challenged the right of the Hutterian Brethren Church to expel him and other members. The igniting issue focused on who owned the rights to a patented hog feeder. The Board of Managers of the Colony had ruled that Hofer did not own the patent of the hog feeder in question and should stop producing the item. Hofer refused to submit to what he considered an injustice and also refused to obey the colony's order of expulsion. In response Jacob Kleinsasser of Crystal Spring Colony, elder of the Schmiedleut group of Hutterites, tried to use the state to enforce the expulsion order. Daniel Hofer Sr. initially lost the case. Hofer also lost his first appeal but finally won on an appeal to the Supreme Court of Canada who overturned the expulsion. The outcome of these two cases has strongly influenced the outcome of similar cases in Canada. When some members of The Nine sued their former colony in Manitoba in 2008 over lost wages and injuries the case was never even heard in court. In the United States judges have repeatedly dismissed cases that were brought against the colony by colony members or former members. Such cases include Wollma, et al. v. Poinsett Hutterian Brethren, Inc. (1994) in South Dakota, and Eli Wollman, Sr., et all. v. Ayers Ranch Colony (2001) in Montana. More recently in North Dakota, a case was brought by some of The Nine against Forest River Colony and was again dismissed by a judge in March 2010, ruling that the courts did not have subject matter jurisdiction over the case. In the last 150 years several subgroups of Hutterites emerged. When the Hutterites migrated to the United States in 1874 and the following years there was a division between those who settled on colonies and lived with community of goods and those who settled on private farms according to the conditions of the Homestead Act of 1862. The homesteaders were called Prairieleut, while the ones who settled on the three communal colonies developed into three branches: Schmiedeleut, Dariusleut and Lehrerleut. In the 1990s the Schmiedeleut spilt into two subgroups. The Owa Hutterite Colony, a Japanese Hutterite community founded in 1972, does not consist of Hutterites of European descent, but ethnic Japanese who have adopted the same way of life and are recognized as an official Dariusleut colony. The inhabitants of this colony speak neither English nor German. In similar fashion, a "neo-"Hutterite group, called the Bruderhof, was founded in Germany in 1920 by Eberhard Arnold. Arnold forged links with the North American Hutterites in the 1930s, continuing until 1990 when the Bruderhof were excommunicated because of a number of religious and social differences. The Community Farm of the Brethren, also called Juliusleut, is a Christian community with communal living at Bright, Ontario, created under the leadership of Julius Kubassek (1893–1961). It was in fellowship with the Hutterites from its beginnings in 1939 until 1950. Starting in 1999 three Hutterite colonies separated from their original "Leut" affiliation and became independent. For these three colonies spiritual renewal became a major concern. One of them, Elmendorf branched out two times, so that there are now five colonies of that kind, that cooperate closely, thus forming a new affiliation of Hutterite Christian Communities. 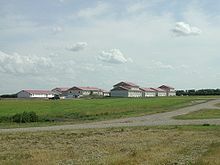 Fort Pitt Farms Christian Community is a Christian Community of Hutterite Dariusleut origin and of many Hutterite traditions, but that is fully autonomous since 1999. When it was excommunicated from the Hutterite church in 1999, about one-third of the people of the colony decided to stay with the Dariusleut Hutterites. Elmendorf Christian Community, founded in 1998, is a Christian community of Hutterite tradition, that is much more open to outsiders, so-called seekers, than other Hutterite communities. 49th Parallel (1941) has a segment that takes place at a Hutterite community in Manitoba, Canada. In the Kung Fu episode "The Hoots" (December 13, 1973), the sheepherder members of a Hutterite religious sect offer no resistance to persecution by bigoted cattlemen, until they learn from Kwai Chang Caine that, like the chameleon, they can change and yet remain the same in the American Southwest. The Hutterites was a 27:56 min documentary filmed by Colin Law in 1964 with the following synopsis: "The followers of religious leader Jacob Hutter live in farm communities, devoutly holding to the rules their founder laid down four centuries ago. Through the kindness of a Hutterite colony in Alberta, this film, in black and white, was made inside the community and shows all aspects of the Hutterites' daily life." On May 29, 2012, the first episode of American Colony: Meet the Hutterites aired on the National Geographic Channel. Filmed primarily at King Ranch Colony near Lewistown, Montana, with Jeff Collins as executive producer, the colony was paid $100,000 for permission to produce a documentary of Hutterite life. Immediately after the first airing, many Hutterites began to complain that the show did not represent a true picture of typical colony life and ended up being a reality show or "soap opera" rather than a documentary. Some of the Hutterite cast later said that some of the scenes were scripted and that they were not aware of how the final version would portray the Hutterites. Jeff Collins stated that he believes King Colony members were coerced to write retractions, under threat of excommunication from Hutterite leaders. Colony leaders from King Ranch Colony wrote a letter to the National Geographic Society asking for an apology and that the show be discontinued, citing a false portrayal of Hutterites and a "breach of contract and defamation of our life and our character" as the reason. In 2013, How to Get to Heaven with the Hutterites was broadcast on BBC2 and looked at the lives of the people within the community. Another film about the Hutterites is The Valley of All Utopias (2012), a documentary about a Hutterite colony in Saskatchewan directed by Thomas Risch. Hutterites were featured in the CBC TV series Heartland in Season 8 Episode 7 "Walk a Mile". Wikimedia Commons has media related to Hutterites. ^ a b Linder, Robert Dean (2008). The Reformation Era. Greenwood Publishing Group. p. 147. ISBN 9780313318436. Hutter was important because he was a fearless, effective leader and because he established the Hutterite colonies on the basis of the Schleitheim Confession, a classic Anabaptist statement of faith. ^ a b c d e Pennsylvania Folklife, Volumes 40–42. Pennsylvania Dutch Folklore Center. 1990. p. 138. The essential beliefs and practices of the Hutterites are embodied in the Schleitheim Confession of Faith. Thus, in addition to a set of community rules for Christian living and the principle of worldly separation, the Hutterites, in accordance with the Schleitheim Articles, subscribe to the faith baptism of sin-conscious adults; the universal spiritual church of believers; the complete separation of church and state; pacifism and the refusal to bear arms; and the rejection of oaths of allegiance. ^ McLaren, John; Coward, Harold (1999). Religious Conscience, the State, and the Law: Historical Contexts and Contemporary Significance. SUNY Press. p. 98. ISBN 9780791440025. The Hutterites are an Anabaptist group founded in 1528 in Moravia. ^ Anthony L. Chute, Nathan A. Finn, Michael A. G. Haykin. The Baptist Story, Nashville, 2015, p. 12. ^ John A. Hostetler: Hutterite Society, Baltimore 1974, pages 10–11. ^ Peter Hoover: The Mystery of the Mark-Anabaptist Mission Work under the Fire of God, Mountain Lake, Minnesota, Elmendorf Books, 2008, 14–66. ^ John A. Hostetler: Hutterite Society, Baltimore 1974, page 12. ^ John A. Hostetler: Hutterite Society, Baltimore 1974, page 13. ^ John A. Hostetler: Hutterite Society, Baltimore 1974, page 8. ^ John A. Hostetler: Hutterite Society, Baltimore 1974, pages 17–20. ^ John A. Hostetler: Hutterite Society, Baltimore 1974, page 31. ^ John A. Hostetler: Hutterite Society, Baltimore 1974, page 61. ^ John A. Hostetler: Hutterite Society, Baltimore 1974, page 63. ^ Johannes Waldner: Das Klein-Geschichtsbuch der Hutterischen Brüder, Philadelphia, 1947, page 203. ^ John A. Hostetler: Hutterite Society, Baltimore 1974, pages 63-65. ^ John A. Hostetler: Hutterite Society, Baltimore 1974, pages 65-67. ^ John A. Hostetler: Hutterite Society, Baltimore 1974, pages 72–73. ^ John Horsch: The Hutterian Brethren 1528-1931. A Story of Martyrdom and Loyalty, Reprint MacMillan Colony, 1985, page 75. ^ John A. Hostetler: Hutterite Society, Baltimore 1974, page 78. ^ John A. Hostetler: Hutterite Society, Baltimore 1974, pages 91-92. ^ John A. Hostetler: Hutterite Society, Baltimore 1974, pages 93-96. ^ John A. Hostetler: Hutterite Society, Baltimore 1974, page 100. ^ John A. Hostetler: Hutterite Society, Baltimore 1974, pages 103-104. ^ John A. Hostetler: Hutterite Society, Baltimore 1974, pages 104-105. ^ John A. Hostetler: Hutterite Society, Baltimore 1974, pages 105-106. ^ Dariusleut at Global Anabaptist Mennonite Encyclopedia Online. ^ John A. Hostetler: Hutterite Society, Baltimore 1974, page 112. ^ Rod A. Janzen: The Prairie People: Forgotten Anabaptists, Hanover, NH, 1999. ^ Michelle M. Stein et al. : Innate Immunity and Asthma Risk in Amish and Hutterite Farm Children, 2016. ^ Esau, Alvin (2004). The Courts and the Colonies. Vancouver, BC: UBC Press. p. 10. ISBN 0-7748-1116-1. ^ Peter, K (1987). The Dynamics of Hutterite Society: An Analytical Approach. Edmonton, AB: University of Alberta Press. p. 345. ISBN 0-7748-1116-1. ^ "How SD became a top place for foreign money | Prairie Business Magazine | Grand Forks, ND". Prairiebizmag.com. Archived from the original on April 3, 2014. Retrieved April 3, 2014. ^ "Turkey Plant Celebrates Grand Opening". Keloland.Com. Retrieved April 3, 2014. ^ "Learning from the Bruderhof: An Intentional Christian Community". ChristLife. Retrieved May 23, 2017. ^ Hutterian Brethren of Wilson Colony v. Alberta, 2007 ABCA 160. ^ Examples of these photos are held by the Museum of Contemporary Photography, Chicago, the Art Institute of Chicago and other institutions. ^ Janzen, Rod; Stanton, Max (September 1, 2010). The Hutterites in North America. JHU Press. p. 149. ISBN 9780801899256. Here their plain style of dress became a distinguishing mark of the Hutterite Christian faith. Plain dress defines sexual roles and status and de-emphasizes the importance of outward forms of physical beauty. ^ a b Kraybill, Donald B.; Bowman, Carl Desportes (September 3, 2002). On the Backroad to Heaven: Old Order Hutterites, Mennonites, Amish, and Brethren. JHU Press. ^ "Review of The Hutterites in North America". Cascadiapublishinghouse.com. Retrieved September 16, 2013. ^ a b Esau, Alvin J. (2006). Courts And the Colonies The Litigation of Hutterite Church Disputes. Vancouver: Univ of British Columbia Pr. ISBN 978-0774811170. ^ "Montana Hutterite colony asks Supreme Court to hear religious liberty case". Deseret News. April 10, 2013. ^ Buckingham, Janet Epp (2014). Fighting over God : a legal and political history of religious freedom in Canada. ISBN 978-0-7735-4327-0. ^ Hitchen, Ian (September 7, 2013). "'The Nine' share their struggles". Brandon Sun. ^ "Manitoba Hutterite colony sued over unpaid labour". The Canadian Press. June 5, 2008. ^ "About Us". Plough. Retrieved May 23, 2017. ^ "Bruderhof Communities - GAMEO". gameo.org. Retrieved November 8, 2017. 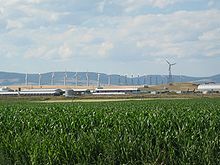 ^ "Fort Pitt Hutterite Colony (Frenchman Butte, Saskatchewan, Canada) - GAMEO". www.gameo.org. Retrieved February 8, 2018. ^ "Fort Pitt Farms Christian Community". Fort Pitt Farms Christian Community. Retrieved February 8, 2018. ^ The 2004 Hutterite Phone Book, Canadian Edition, James Valley Colony of Hutterian Brethren: Elie, Manitoba. ^ Colin Low. "The Hutterites by Colin Low - NFB". Nfb.ca. Retrieved September 16, 2013. ^ "Another View of "American Colony"". Hutterites. June 1, 2012. Retrieved September 16, 2013. ^ kwollmann (June 21, 2012). "Reflection: American Colony | Ask a Hutterite". Askahutterite.wordpress.com. Retrieved September 16, 2013. ^ "The Making of "Meet the Hutterites": Resources". Society Matters. Retrieved September 16, 2013. ^ "Hutterites want apology for NatGeo television show". Fox News. August 8, 2012. Retrieved September 16, 2013. ^ "Letter to John Fahey". Scribd.com. Retrieved September 16, 2013. Peter Riedemann: Rechenschafft unserer Religion, Leer und Glaubens, von den Brüdern so man die Hutterischen nent aussgangen, Moravia, 1565, several reprints. Rudolf Wolkan (ed. ): Geschicht-Buch der Hutterischen Brüder. Standoff Colony near Macleod, Alberta, Canada, 1923. Johannes Waldner: Das Klein-Geschichtsbuch der Hutterischen Brüder, Philadelphia, Pa., Carl Schurz Memorial Foundation, 1947. Robert Friedmann: Die Schriften der Hutterischen Täufergemeinschaften, Wien, 1965. John Horsch: The Hutterian Brtheren 1528-1931, Goshen, Indiana, 1931. John A. Hostetler: Hutterite Society, Baltimore, 1974. John Hofer: The History of the Hutterites, Altona, Manitoba, 1982. Karl Peter: The Dynamics of Hutterite Society, Edmonton, Alberta, 1987. Rod Janzen and Max Stanton: The Hutterites in North America, Baltimore, 2010. John Lehr and Yosef Kats: Inside the Ark: The Hutterites in Canada and the United States, Regina, 2012. Donald B. Kraybill: On the Backroad to Heaven: Old Order Hutterites, Mennonites, Amish, and Brethren, (co-author: Carl Bowman), Baltimore, 2001. Rod A. Janzen: The Prairie People: Forgotten Anabaptists, Hanover, NH, 1999. Michael Holzach: The Forgotten People: A Year Among the Hutterites, Sioux Falls 1993 (German: Das vergessene Volk: Ein Jahr bei den deutschen Hutterern in Kanada, Munich 1982). Lisa Marie Stahl: My Hutterite Life, Helena, MT 2003. Mary-Ann Kirkby: I Am Hutterite, Altona, Manitoba 2008. Kristin Capp: Hutterite: A World of Grace, Zurich and New York 1998. Samuel Hofer: The Hutterites: Lives and Images of a Communal People, Sioux Falls, 1998. Written by an Ex-Hutterite.